Continuing the ongoing series of interviews with creative artists working on various aspects of movie and TV productions, it is my pleasure to welcome Pete Oswald. 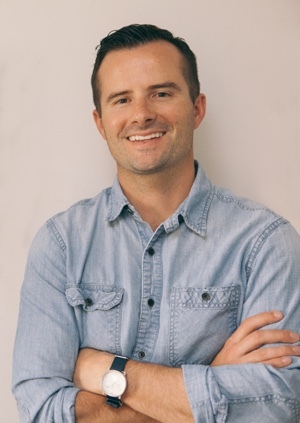 In the last few years he has worked on “Madagascar: Escape 2 Africa”, both “Cloudy with a Chance of Meatballs” movies, “ParaNorman” and “Hotel Transylvania”. And just a couple of months ago he completed “The Angry Birds Movie” on which he was the production designer. In this interview Pete talks about the magic of animated films, the transition of the industry from hand-drawn animation to CG [computer generated], the yet-unsolved problem of faithfully reproducing human skin, creating animated universes not bound by physical laws of the real world, the job and the responsibilities of a production designer on an animated film, and the overall structure of a production. And as we talk, Pete delves deeper into the details of bringing the Angry Birds story from the original game franchise to the big screen. Kirill: Please tell us about yourself and how you got into the animation industry. Pete: I’ve always been an artist. My mom is a painter and a fine artist. As a child, she would teach art classes in our basement. I would sit in the back and draw all day. I always thought of going into this profession, and when it was time to look at colleges, I didn’t really know that animation was a real job [laughs]. I grew up in Salt Lake City, Utah, far away from Hollywood. I didn’t know you could actually make a living in animation until I started looking at colleges in LA. That’s when I realized that a lot of my drawings had an animated feel to them. I started doing more research. I read Disney’s “The Illusion of Life” and got hooked. I went to Loyola Marymount University in Los Angeles to study animation and minor in graphic design. From there I was able to get hired to do my first job at the Cartoon Network, and then my career took off after that. Kirill: When did you start working in the industry? Pete: That was around 2003. I got hired by the Cartoon Network to work on the show called “Foster’s Home for Imaginary Friends” as a character designer. I learned so much in my first few years at that studio through some amazing artists. Then I went on to work on “Madagascar: Escape 2 Africa” at Dreamworks. That was an amazing opportunity too because I got to experience my first feature film. After that I went on to work on “Cloudy with a Chance of Meatballs” at Sony. 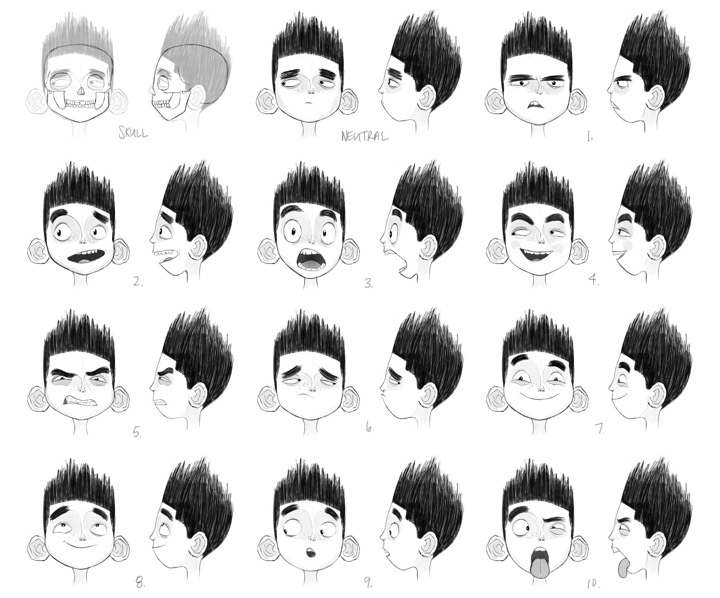 “ParaNorman” at Laika, then back to Sony to work on “Hotel Transylvania” and “Cloudy with a Chance of Meatballs 2”. 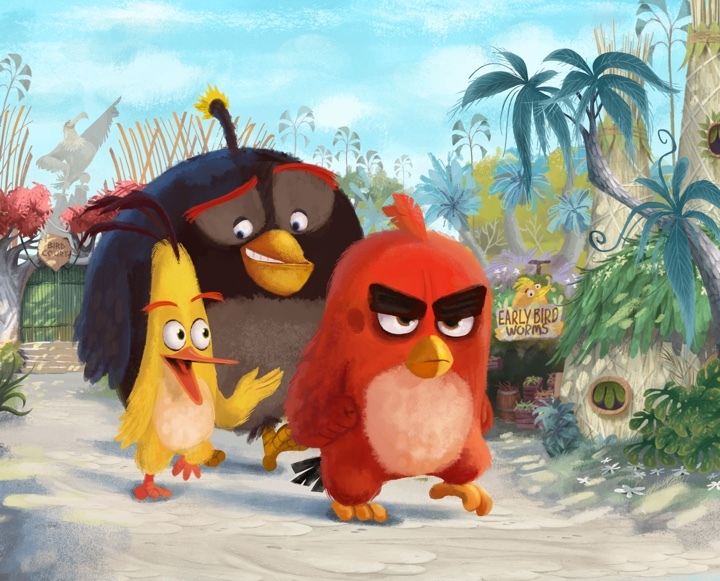 And now I’ve just finished up “The Angry Birds Movie” on which I was the production designer. Kirill: Bringing you back to 2003, hand-drawn animation was still going strong. Pete: Yes, it was. I think we were just starting to get into the CG [computer generated] realm. 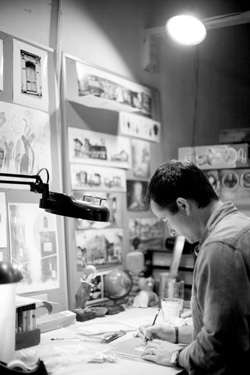 A few very successful CG films have come out by then – “Toy Story” and “Toy Story 2” and some of the first Shrek film. 2D was still on the cusp and not quite dead yet. In school they wanted to teach us both, because it’s great to learn both mediums and have an understanding of the entire process. It was really interesting to see the entire transition from 2D to CG. I think at the end of the day it’s all still about storytelling and it becomes a different technical approach. Both are really great, but the computers are so powerful now and they can do anything you want them to do. 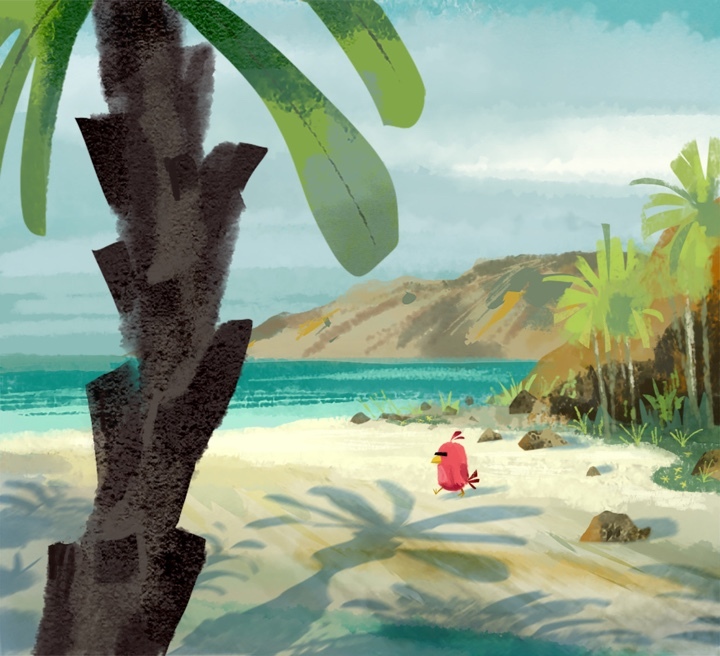 Sketch for “Cloudy with a Chance of Meatballs”. Kirill: Have we seen the last breath of hand-drawn animation, at least in feature productions? Pete: I don’t think it’ll ever die. In features I think Disney’s “The Princess and the Frog” was the last American animated feature film. But Studio Gibli is always creating beautiful work out of Japan, and Hayao Miyazaki is keeping the 2D world alive, and it’s so good. It just depends on how you want to tell the story. Right now CG is what audiences want. Kirill: What is it about CG? Is it the level of detail, the sophisticated look of it? Pete: I think so. It’s an easier translation to the real world. We can light and texture things, and make it feel like it looks in real world. And whether it’s more cartoony or more realistic, that’s a separate design theory. Because the computer can do that, I think it engrosses the audience and it makes you feel like you’re in that set, or talking with that character. The textures feel real, the lighting feels real, and I think that’s the sophistication that draws the audience to this. Kirill: And yet nobody’s been able to solve the look of the human skin. It feels like it’s the last big unsolved piece to getting to photorealism in animation. Pete: That’s always the really tough thing to tackle. There’s really no substitute for human skin. I tend to like CG things that aren’t realistic, that aren’t photo-real. You have to get everything right for it to look exact. Our eyes are so sophisticated. You can immediately tell that it’s off and that it doesn’t look right. I come from more of a cartoony background where I like to exaggerate and caricature, and I’m not too concerned that the skin doesn’t look realistic. I like to design shapes that are pushed and expressive. It’s more about the story and the emotion of the characters and environments than the photorealistic aspect. Kirill: And in stories such as “Madagascar” or “Angry Birds” we might not be looking for the animals to be photorealistic. We’re there to be entertained, and I guess kids don’t care as much either. Pete: As an audience member, you easily transpose yourself into that world. 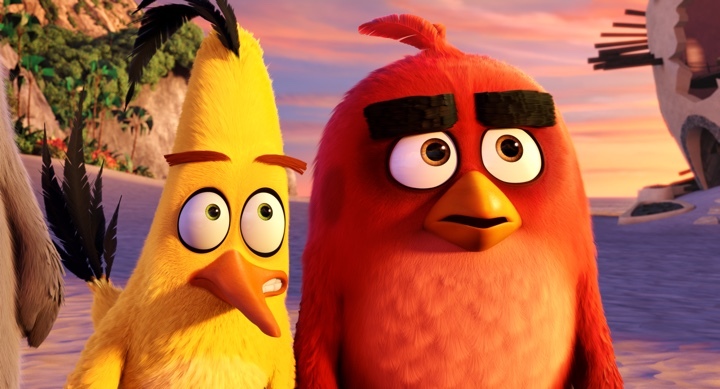 We’re not concerned that Red from “The Angry Birds Movie” should look like a real bird. We did that on purpose. We made him more anthropomorphic and creature-like. He has a beak and feathers. He’s iconic as a bird, but he’s not a photo-realistic bird. Red had to be appealing and cute because of his anger issues. There’s a great juxtaposition between cute and dangerous. That’s what makes Red a successful character design. Kirill: And the main characters came from the world of the original games. Pete: It was one of the biggest challenges of the production – how do you translate a game into CG feature animated film? Now that the birds walk and talk, and are not just the bouncing balls from the game anymore, how do you keep those iconic characteristics? Red has black eyebrows, for example, and we needed to make sure that the iconic look was evident the film to have the brand stay recognizable and to make everything work together. We had to balance that throughout the whole process. Kirill: You’re creating an animated universe, and you don’t have to be bound by the physical laws of our world, as long as you stay consistent within that universe. How does it feel to be free to create and to mold such a universe? Pete: That’s a really good question, and that’s one of my favorite things about animation. You can create anything, and with the technology of today, the computer can do everything. For instance, all the birds live on Bird Island. We knew that they were not actual birds, but we wanted everything on that island to be built by the birds for the birds. We used things that people know about birds in nature, birds in real world. There’s the materials that real birds use for their nests and we wanted to have the naturalistic organic qualities inform the way that we would construct their houses and their stories. We would take nest material and we would build their huts out of that, so that it felt like a bird actually built that from the real world. But it becomes a whole new universe in and of itself. Familiar, yet unexpected. Kirill: What about the pig city? Pete: That was so much fun to design. The approach to building that city had a simple theory. It’s architecture of idiocy. It’s a topsy-turvy, very illogical way to build things. We used the basic building elements of glass, wood and stone from the game, and then gave a lot of personality to the design. They have sky-rise apartments built with glass that are held up by helium balloons, and they use TNT crates as building blocks. They’re not smart creatures, and they’ve constructed their world in an opposite way to how the birds constructed theirs. The birds’ world has an organic quality, while the pigs have all these man-made materials. They have TNT and airplanes and power. The two worlds really contrast themselves. Kirill: You mentioned that it’s possible to do everything on computers these days. Who defines the capabilities of those tools. I’d imagine that every studio has its own team that evolves their hardware and software, and as you join the specific production, you’re working with that team on their platform. Pete: Yes, you’re exactly right. Rovio is the company that created the game app and that funded the film, and that’s who I work for. We worked with Sony Pictures Imageworks up in Vancouver who did the digital production of the film. Every day we would have meetings with Sony Pictures Imageworks. They have proprietary software, and they did all the animation, lighting, texturing and the final 3D rendering of the film. We used their tools, and they did such an amazing job of creating this world that looked and felt so real, but was also a caricature of the game. It’s really using their sophisticated tools, whether it’s modeling, or lighting, or texturing, or animation to create the entire world. Kirill: How complicated is it to change something? If you need to add more floors to a building or reposition a village to another part of the island, is that relatively easy? Pete: It’s still manual work for the animators and the modelers. There are some things that we can do procedurally, but at the end of the day, when we’re composing a shot and seeing that a building is too short, that’s manual work. An artist will have to construct a new portion of the building, or take a building that’s already been built and stack it on top of itself. There are ways to simplify it, but at the end of the day it is still hand-made. Every frame of the film is being scrutinized and given crazy amounts of love. Kirill: You don’t operate in the physical world where you can go into the set and start moving or manipulating objects with your hands. Do you miss the immediacy of control where your instructions need to be carried out by layers of people who work with those software tools? Pete: At the end of the day it just becomes part of the job. We do have the capability, even if I can’t physically go there and move a table on the set myself. I can do a quick draw-over and say move the table over there. It just feels like another extension when you’re talking about moving pieces or changing camera angles. It’s not stifling at all. It’s liberating, because the computer can make anything you want. It’s just a matter of making your decisions and staying on budget. I’ve worked so long that way. 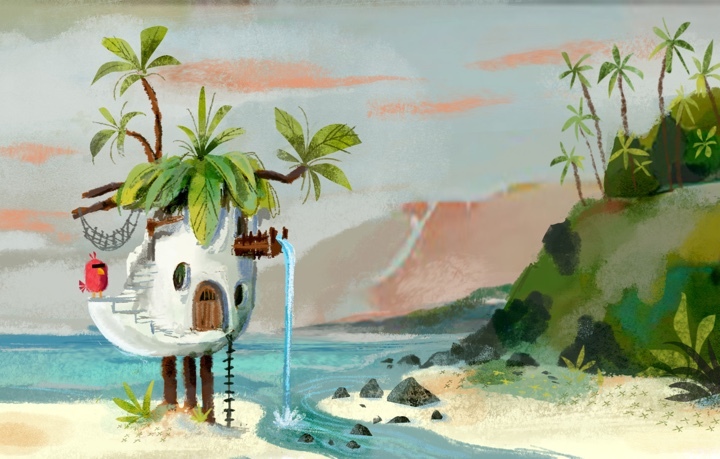 It may feel different for a live-action production designer coming in and doing a CG-animated film. But that’s the way I’ve always done it, so it just feels natural. Kirill: I was looking at the crew list of “The Angry Birds Movie” and I noticed that there are two directors but no cinematographer. Not all animated movies have a cinematographer, but I wonder who is in charge of defining the angles, doing the lighting and the rest of the “usual” responsibilities that fall into that category? Pete: On “The Angry Birds Movie” the cinematographer was Todd Heapy who was the head of previz (pre-visualization). He and his team set up all the shots and all the camera angles. He was the main cameraman of the production. Kirill: Taking “Angry Birds” as an example, can you walk me through the different stages of an animated movie production? Pete: As a production designer, I’m in charge of creating the visual language of the film. I work closely with the directors and the producers to select the settings and the style to visually tell the story. Through drawings and paintings, my team and I create the atmosphere and the emotions that support the script. I think about it in two basic ways- development and production. The beginning is development. Sometimes it’s a short burst, as on this film where we only had a few months. On other films it might take years. This one was on a fast track, and we had to make our decisions quick. We set some design rules for the world and we figured out the character designs and then we went into production. That’s when things really move. For example, to design a set we start first with sketches. It’s on paper, with really loose concepts and ideas. I pitch a few ideas to the directors, see what they like and then refine them with my team. Sometimes we add a bit of color to it, and it becomes a two-dimensional painting. You get more notes, and it goes back-and-forth, solidifying the design in a 2D form. Then that design goes to the previz department and they build a really rough model in CG. We’re not concerned about the details and the looks, but rather more about how big are the doorways, and how big the building or whatever the set may be is. We have really simplified versions of the characters so that we can put them within that environment and see how they fit. That’s when we really determine the scale of it, and some of the main layout details. You might see that a room is way too small and you need to scale it up, for example. And that’s something that you can’t figure out in a two-dimensional drawing. You have to figure it out in a 3D space. Kirill: Do you build miniature models as well? Pete: Every once in a while we do. On this film we didn’t. The production was so quick, and we didn’t have time to make any real physical models. To keep the pipeline of production moving, we modeled everything in the computer. With more time I would have loved to build some miniature sets. Then, once we create that rough version of a set, we turn that over to Sony Pictures Imageworks. They start from a basic 3D sketch of the environment, along with our paintings and lighting and texture callouts of what we want it to look like. That’s when their team of modelers, texture artists and lighters begin to work. We’ll have multiple reviews with them refining that set. They’ll give us renders of different times of day, and ask to look at different types of lighting. Animation starts simultaneously, and that’s when all the worlds collide at the very end. Once the layout is approved and animation is completed, the lighting is the last stage that we go through for the approval process. When the lighting is finalized, the sequence is approved. Kirill: It sounds like the entire storyline gets progressively more layers and sophistication applied to it with each pass. Pete: Yes, there are more passes over the entire film. But there are always story changes. In the middle of this process we might decide to take a set that was originally planned for a certain scene and use it for something else. You have to stay very nimble in the process. The further you get in building a set or a character, the more locked down you become. Kirill: When do the actors come in to do the voices? Pete: The voice actors come in a record very early in the process. We don’t do any animation before the final voices are recorded. Kirill: Is there any particular part of the overall process that creates the most pressure on an animated feature for you? Is there any particular pressure around working with the schedules of those actors? Pete: Everything is expensive on an animated film. Every decision you make is going to have ripples. It’s important to determine what is important to tell the story. That is where you should be spending your time and money. Kirill: As you look at how much time you’re going to have to make a movie, the entire crew has to be very precise with the schedule. If you put too much time into any specific pass that you mentioned, that would delay the entire pipeline. Pete: You’re exactly correct. That’s probably one the most difficult things in creating these films. There’s so much to create and you want everything to look good. But when you’re designing the sets, you have to take a step back and see what’s important for the story and what the audience is going to pay attention to. There are definitely things that I wish were designed better, but you have to make those decisions. Is the audience even going to notice that some tree didn’t have the exact texture that you wanted it to? Where is your focus? It really comes down to the story. Kirill: After you start your sketches with pencil-and-paper, do you then go into any of the Adobe tools to flesh out more details? Pete: Adobe Photoshop is my number one tool that I use. I still do little thumbnails on post-it notes, but 90% of the time I work within Photoshop. I do sketches, final paintings, lighting ideas for color – it’s an amazing tool. I work on a Cintiq so I can draw directly onto my tablet, and it feels more like drawing on the real paper. There’s still no substitute for the tactile feel of drawing on real paper or painting with real paint, but as far as creating something and making it editable to quickly change the color or scale, Photoshop is a powerful tool. I don’t know how I’d do my job without it. Kirill: Every generation of animators has its own tools, and what people back in Walt Disney era did without computers was amazing. You might have all the tools, but if the story is terrible or if you’re a terrible storyteller, the tools won’t save you. Pete: You technical capabilities or your tools don’t matter at the end of the day. It all depends on your story and your characters. You can tell a great story with just simple line drawings and crude animation. If the story is great, it is great. What digital animation provides is the next level of believability. I think it will just enhance the experience. Kirill: Now that you’re a production designer, does it help that you’ve had a variety of roles in the graphics department, and you know what is expected from people who work with you? Pete: It’s extremely helpful. All those years doing different jobs informs me as a production designer now. I always try to look at it from the point of view of the artists. If I was in their seat, how can I best communicate the idea. Doing that is essential. If I came out of school and became a production designer, I wouldn’t be successful. I wouldn’t know those individual jobs and how to give clear direction. Kirill: Is there a post-production phase on an animated feature, or is it all just production? Pete: There is a post-production phase. We’re always working to the final frame, and there’s the last edit, and adding music, and doing the color timing of the film. I stay on until the very end. I’m in all the color timing sessions, making notes on the final frames. Kirill: So you see the entire lifespan of a production. Pete: I do – from the script to the final movie. And that’s a great thing about my job. I get to see the movie evolve and grow. I get to collaborate with so many talented people. That is the best thing about my job. Kirill: Bringing you back a few years ago to “ParaNorman” that you did at Laika, how different was that production? Pete: Because it’s stop-motion, it’s a different process. We’re so used to looking at things in a computer, and it was really refreshing to go to a studio and to be able to touch the characters. You could walk around the sets and physically see and feel them. They have a modeling department and a costume department. The process is so tactful. I loved it. It was a really great experience, and it makes me appreciate the digital form even that much more. The handmade quality is what is so unique about Laika. Every frame is hand made. Kirill: Was it more time-consuming because of that? Pete: I think it’s about the same amount of time. Their production schedules are very similar to the CG productions. I think they’re able to keep up. Kirill: My impression around ten years or so ago was that a few production / software companies promised the world in which there are these vast libraries of digital artifacts, and as a director or a production designer, all you do is pick whatever objects you need from those libraries and quickly combine them together to create any scene or any set. That didn’t seem to happen, at least not yet. Pete: I think that every production wants to make something new and fresh.It comes down to two things: creative ideas and technical capabilities. Our digital age is changing and adapting so fast. If we were to make “The Angry Birds Movie” today, it would probably look different than when it just came out a few months ago. It’s those two things that lead to creating a new and better film each time. Kirill: Do you ever catch yourself wishing that you had a certain tool at your disposal for that particular production that you’ve worked on a couple of years ago? Pete: I try not to think about that. It’s just the way it goes, and the way the reality is. Some things that you couldn’t do ten years ago, you can do really easily now. And to be honest, that’s not my specialty as far as the tech goes. I would have an idea, and then ask the visual effects (VFX) supervisor to sort out the technicalities of it. 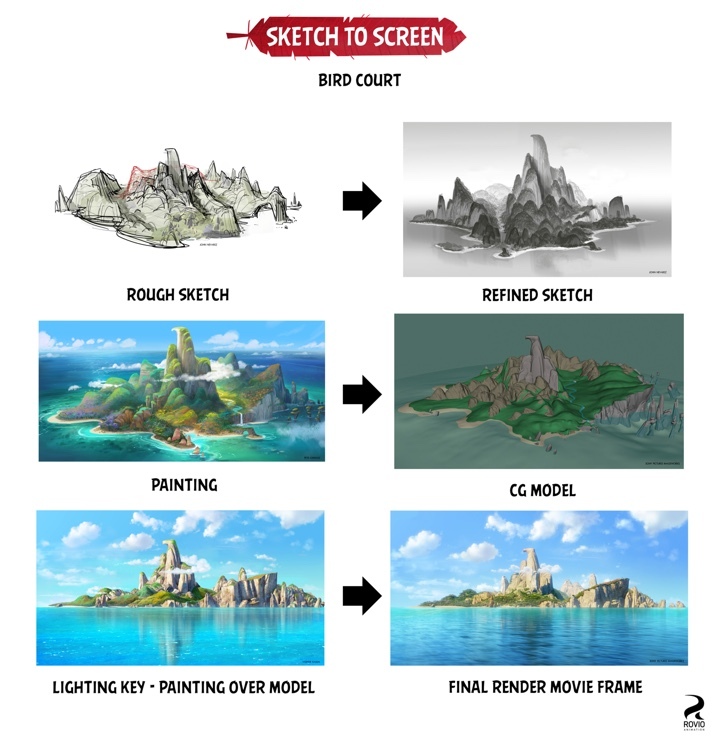 Kirill: What is the scope of responsibilities of a VFX supervisor on an animated film? Pete: We take our concepts and designs, and turn them over to the VFX supervisor. Then he’d tell us how he’d be able to build that using our designs and our ideas, transforming them into a CG model, into a fully-lit environment. The VFX supervisor is involved with every step of the digital production. That’s one thing I love about animation. You have to create everything. In live action you pick up the camera, and things already exist as far as, for example, trees in the background. In animation we have to design everything. 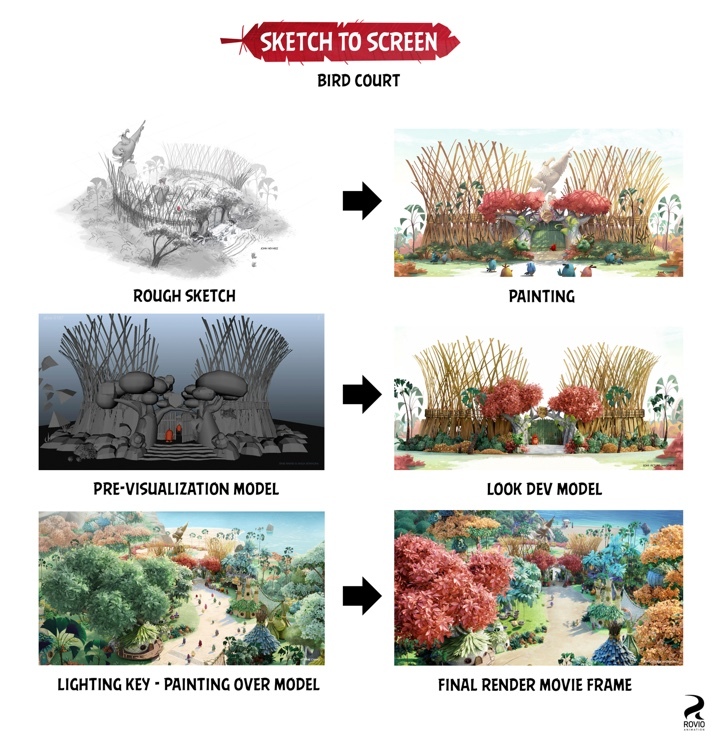 Sketch-to-screen sequence for “Angry Birds”. Kirill: What are your thoughts on the wave of 3D productions in the last few years. For me as a viewer it feels like it’s been slowing down, even in animated movies. Was it a fad? Was it abused by productions that didn’t benefit at all from 3D? Pete: It’s hard to say. It’s usually decided by the studio executives. I think that stereo has great capabilities. I had a blast doing stereo on “The Angry Birds Movie” – it changes the experience. But it’s not for everybody. It’s definitely a subjective choice. Kirill: When you do your designs and your setups knowing that there’s going to be a 3D version of that movie in the theater, do you do anything specific for the 2D experience when we watch it later at home on our regular TV screens? Pete: We’re just trying to make the 2D version read. We’re trying to make the comedy or the action read. And we definitely try to enhance the 3D version. In “The Angry Birds Movie”, it’s when the birds are flying, when they are getting shot from the slingshot. We wanted to make them feel like they’re coming into your face. Or you’re on the back of Chuck, going into the walls or the castle – you’re along for the ride. It’s those types of situations that really enhance the experience. There are no separate 2D and 3D versions. Kirill: You’re spending so many months working on a production and seeing it evolve from those initial sketches. Do you get to enjoy it seeing it in the theater? Pete: One of the most satisfying parts of my job is going to a theater and just watching people’s reactions. I know what’s happening on screen, but listening and seeing people’s reactions – there’s no better feeling than seeing a live audience react to your movie. Kirill: Do you try to stay informed of what is happening in your industry, of where the technology is going, of what your peers are pushing for? Pete: Definitely. That’s part of my job, and I always try to keep up on the latest technologies, and how other studios are creating their characters or designing their sets, and what they’re using for software. And then also it’s about the design styles and the creative choices they make. Kirill: Do you see yourself working on a live-action feature? Pete: I’d love to one day. The live-action world is foreign to me, because I’ve only worked in animation. Kirill: Do you think we’ll ever run out of stories to tell? Pete: No. There will always be stories to tell. It’s just the matter of telling the good ones. It’s where I get my inspiration – from living, from spending time with my kids, from driving down the street and seeing a crazy character on the side of the road. It’s getting those relatable situations and transposing them into fun and engaging stories and characters that we know and love. Kirill: And some stories can only be told in animation. 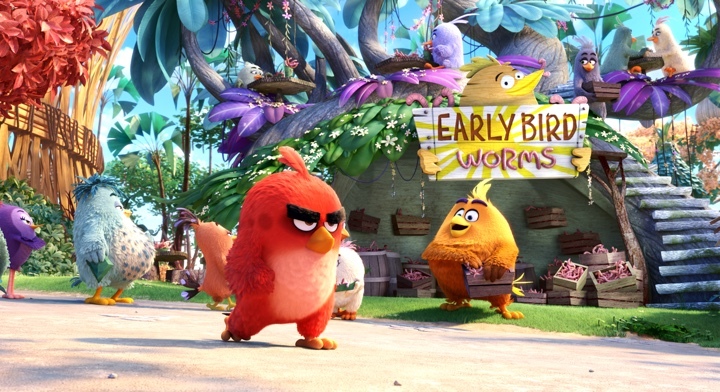 It’d be hard to imagine something like “The Angry Birds Movie” in live action. Pete: There should be reasons why a project needs to be animated, and “The Angry Birds Movie” was a great project for that. If it was live action, it wouldn’t work. I think that’s a really great question to ask at the very beginning – why is this project animated? Does it need to be animated? And if it doesn’t, then let’s make it live-action. That’s a really important question to ask. Kirill: Looking at the list of the productions that you’ve worked on – from “Madagascar 2” to “Cloudy with a Chance of Meatballs” to “ParaNorman” to “Hotel Transylvania”, it’s hard to see which one could be done as live action. These stories belong to be animated. Pete: Animation enhances the experience. If you’re talking about “Hotel Transylvania”, it was the animation and the expressiveness of those characters that made it a great film. If it was shot as live-action, you wouldn’t be able to get that expression. Kirill: I remember as a kid going to this one movie theater in Moscow that only showed animated films. Then as I got older, I was this weird guy showing up to watch an animated film while all the rest were families with kids. And now I take my kids to see these movies, and I honestly don’t know which one of us enjoys them more. Pete: That’s great. I was that weird guy next to you [laughs], doing that same thing before I had kids. I would go to animated movies as an adult, and enjoy them. It’s just storytelling, and it’s fascinating to see what the technology can do. I hope that one day animation isn’t just seen as a kid genre. Animation can tell any type of story. Kirill: I don’t know exactly when it started, but I do love that the scripts nowadays throw in jokes that are only for the parents and the adults in the audience. Pete: It’s something that we really concentrate on with these big budget animated films. You want to make it appealing for everyone, male and female, young and old. Making a four quadrant film is a hard thing to do [laughs]. And here I’d like to thank Pete Oswald for this great opportunity of lifting the veil and getting to know what happens during the production cycle of an animated film. I’d also like to thank Andrew Cohen for putting me in touch with Pete. Background materials for the interview were provided by both Pete and Andrew. “The Angry Birds Movie” will be out on DVD, BluRay and your digital service of choice on August 16. And if you’re interested in stories on how films and TV shows are made, click here for more in-depth interviews.